Cheer on the tigers like a champion. 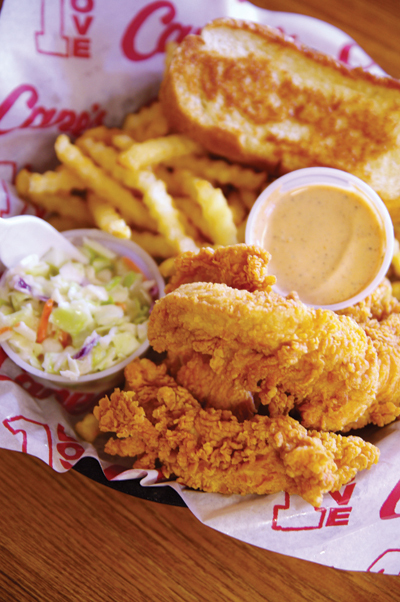 Duck into the original Raising Cane's for pre-game fried chicken fingers and fries. The franchise was famously concieved of in a class at LSU. |!! !|Beyond the North Gates|! !| Louie's Cafe is a favorite spot for breakfast and late-night noshing. The popular |!|Mitchell|! !||!| omelet is suffed with mushrooms|! !| hashbrowns|! !| sausage and colby cheese. On seven Saturdays each fall, Ted Guillot rises before the sun – well, before he would awaken on a normal workday – and makes the 35-minute trek from his Gonzales home to his favorite tailgating spot on Louisiana State University’s campus. Located on the east side of the Parade Grounds, next to Coates Hall and the clock tower, he knows the spot as well as he knows his own address. And for those seven football Saturdays, it’s a second home. “I like when the tailgate spot is set up early in the morning,” Guillot says. “It’s a nice cool morning, and we’ll crack the first beer, get the black pot going with some oil and the trinity in there, smell the beginning of the day’s cooking. That part of the day, mid-morning, that’s my favorite. After that, it can get a little crazy throughout the day." Guillot is one of a professional class of tailgaters – his group is called T.B.A. Tailgating – and along with many others of their kind, these weekend warriors are the current generation of LSU alumni advancing the school’s robust tradition as the best tailgating atmosphere in America. Part food festival, part cocktail party and part family reunion, words belie LSU’s tailgating ambiance, but if you go – and you should – here are a few pro tips to file away before you plot your own trek on a college football Saturday. First, the bad news. Navigating traffic and finding a parking spot have induced rage in even the most docile and patient of drivers. So the best advice is to follow Guillot’s lead and go early. If you can, park at the Hart Lot, on Aster Street on the north side of campus, or one of the two Levee Lots along, you guessed it, the levee on River Road. Both are long walks from most on-campus tailgate destinations, but each offers easy access to I-10 and away from campus as more than 100,000 people attempt to leave after the game. Alternatively, if long walks are not for you, full season and individual game parking permits can be purchased through the university. Once parked, you may want to charge your proverbial batteries before heading to campus. Beyond the North Gates, Louie’s Cafe (3322 Lake St.) is a preferred breakfast and late-night dining option. The “Mitchell,” an omelet stuffed with mushrooms, hashbrowns, sausage and colby cheese is an especially popular choice. Additionally, if a caffeinated jolt is what you need, Highland Coffees (3350 Highland Road) is another near-campus favorite. Before leaving the North Gates area, there are two other spots worth ducking into. The original location of the now-widespread Raising Cane’s franchise (3313 Highland Road) serves up piping hot fried chicken fingers and fries to customers loyal to the business famously conceived in a class at LSU. Finally, The Chimes (3357 Highland Road) is perhaps the most well-known establishment just off campus, with students “warming the stools” having received a shout-out from former President George W. Bush in commencement address at the university. With more than 200 beers available on tap or in the bottle, it is a rite of passage for students to go “around the world.” Those that complete the journey are memorialized in bronze on the walls. If you go, be sure to peruse a few of the names, and bonus points if you can find your author’s moniker. If for parking or other reasons the North Gates area isn’t in the cards, Fred’s In Tigerland (1184 Bob Pettit Blvd.) is another pre-tailgate gem. Known more for its late-night quintessential collegiate party atmosphere, on football Saturdays Fred’s offers $20 steak dinners. If you go, you’ll also find tailgate bean bag toss games underway on the outdoor patio. Fred’s is always a relaxing and fun way to start a tailgate party, but beware of their Vegas Bomb. More than one of these concoctions has led many a would-be tailgater astray before ever making it on to campus. Now that you’ve made it through pre-tailgate festivities, it’s time to embrace LSU’s famous on-campus game day experience. The experience usually depends on the opponent and the time of year. Earlier in the year, when the weather is warmer and the opponent is from outside of the Southeastern Conference, the atmosphere is more relaxed. Guillot says the Alabama game draws the biggest on-campus crowd, but his tailgate is prepared to receive scores of LSU fans and fans of the opposition alike. LEFT: Go "around the world" at The Chimes by sampling all of their beers. Note: there are more than 200 kinds. Upon completion, commemorate your trip with a bronze plaque. RIGHT: Fred's In Tigerland is famous for its pre-tailgate and post-tailgate festivites and potent Vegas Bomb. Get a $20 steak dinner on football Saturdays and enjoy bean bag toss games on the outdoor patio. Steve Duncan, who has been tailgating at LSU for 30 years, said the party – and the cooking – evolve with the season and the opponent. Duncan added pulled pork or cochon de lait are favorites when the Arkansas Razorbacks travel to Tiger Stadium. Wes Galjour, who has been tailgating with his father at their parking spot between Allen and Lockett halls since he was 3 years old, says tailgating at LSU isn’t just about food and football. Now that he has his own kids, it’s truly a family affair. Still, Galjour says, his plans may be dictated by the opponent. Food, football, family and fun – these are a few of the traditions setting LSU’s tailgate experience apart. But, there are a few others to keep in mind. Traditionally, LSU plays at night. It never rains in Tiger Stadium. But one of the best traditions is to venture over to “Victory Hill” two hours before kickoff. There, in succession, the football team, followed by LSU’s mascot, Mike the Tiger, followed by the Golden Band from Tigerland make their way down the hill. It’s also a prime spot to encounter opposing team fans and lob a friendly “Tiger Bait” chant as they make their way to the stadium. Even if you don’t have a ticket to the game, the tailgate party doesn’t end, and there’s inevitably a spot just for you.